Electronic Arts launched FIFA 14 in the App Store yesterday as a free download, supported by in-app purchases to unlock three additional premium modes. This game features 600 license teams, 16,000 players and 33 leagues supported by high quality graphics, hence its 1.35GB download size. EA first announced the game would be free on iOS and Android back in late-August. REAL PLAYERS. REAL TEAMS. REAL LEAGUES. Welcome to the most authentic football game on the App Store. 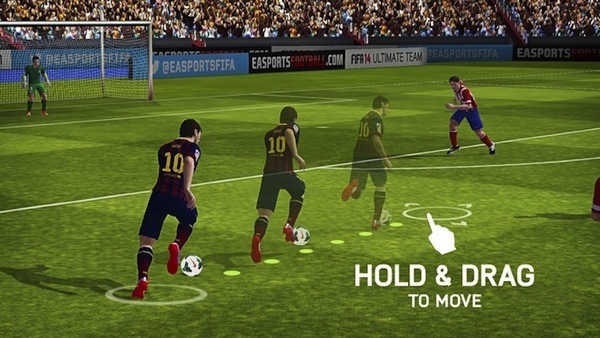 Feel the excitement of every pass, shot, and tackle with new touch controls. Plus, live every moment of real-world football mastery with EA SPORTS™ Football Club Match Day. Get in there! FIFA 14 also features 14 commentaries in five different languages (English, French, Italian, German and Spanish). With its new touch controls and online multiplayer, this looks like one fun game for any football fan. Today also marks the North American launch of FIFA 14 on Xbox 360, PlayStation 3, Windows PC and PlayStation Vita. EA says a record 5 million fans downloaded the console demo of the game when it was released two weeks ago. So far, early reviews in iTunes have been quite positive. Let us know how you’re liking the game! Click here to download FIFA 14–it’s free.